Most people probably wouldn’t argue with the saying that your employees are the most important asset to your company. And fair enough, it is actually true. In most cases. Study after study shows that the benefits of employee engagement activities are clear. It reflects directly on your bottom line. In fact, engaged employees outperform their disengaged counterpart by 20%. In a study, Gallup found that companies with approximately nine engaged employees for every disengaged employee experience upwards of a 147% higher earnings-per-share (EPS) compared to their direct competition. But the importance of employee engagement doesn’t only translate into to profit and loss. It also comes down to retention and absenteeism. 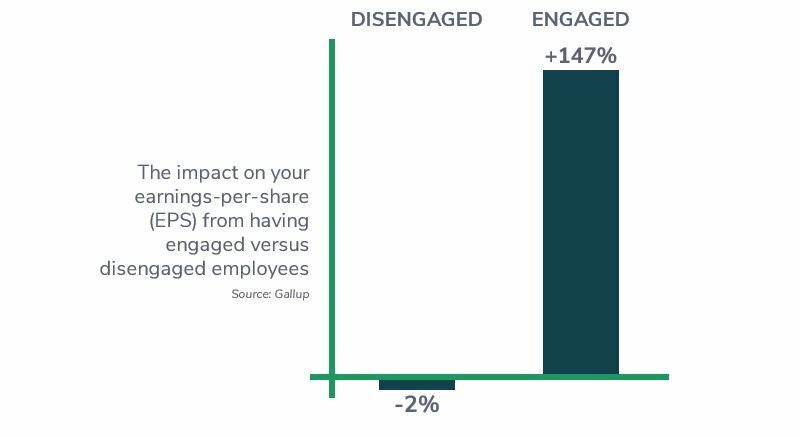 The impact of employee engagement on your earnings-per-share (EPS). Companies employing highly engaged employees experience a 147% higher EPS than their competitors, while companies with disengaged employees experience a 2% lower EPS than their competition (Source: Gallup). So, just how important is employee engagement actually? Extremely important. Because having disengaged employees is an immense drain on your organization and your team’s motivation and willingness to go the extra mile in their job. While you can experience a great return of a 147% higher EPS for having engaged employees, you are likely to lose money if you don’t have enough. In fact, if you only have around 2 ½ engaged employees per disengaged employee, you are likely to experience a 2% lower EPS than your competition. Creating an environment that is conducive to engagement and supportive of recognizing achievements – as well as embracing failures as a learning point – is the corner stone in any organizational culture striving to encourage a motivated behavior. In this article, we are offering you three steps to improve employee engagement by building a work environment that fosters an engaged workforce. Eventually, this is what will accelerate your business. Download the free whitepaper on how to boost employee engagement by motivating your team.